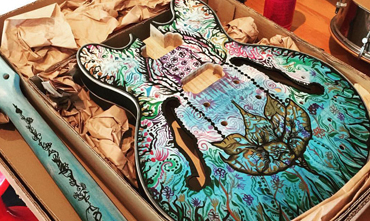 The concept was easy: Invite some of the Eyre Peninsula’s most talented artists to make their mark on some bare guitar bodies, rebuild them, display them for all to enjoy, and then auction them off for charity. An online auction will commence sometime before the festival starts, and all proceeds will go to ‘The Runaway Brides Variety SA.’ The Runaway Brides are a Port Lincoln team who take part in the South Australian Variety bash each year. For the past 10 years the Brides have worked hard to fundraise for the charity in the lead up to the bash. Each year, thousands of children who are sick, disadvantaged or have special needs, get support from Variety the Children’s Charity when they need it most.